Terry Raphael (right) and Frank Lanjan wear MK4 CCBA rebreathers in preparation for a helocasting mission (jumping from a helicopter into the ocean). It was just after 8 p.m. in Vancouver, B.C., when I got a call from my husband, Terry, to let me know we would have to postpone our scheduled video chat. He said he had an emergency to attend to and would call me afterward to explain. He was 15 hours ahead of me — well into the next morning of Sept. 20, 2012 — and had just received an urgent call from a nearby dive center asking him for help. Terry is the diving supervisor of Special Response Team Diver, VAT 69 Special Operations Forces, Malaysia, and his unit was camped on Pulau Perhentian, a small island off the east coast of peninsular Malaysia. A panic-stricken dive instructor on his way back from a morning dive contacted Terry to report that a guest diver had become severely ill following a short, nearshore dive to about 40 feet. 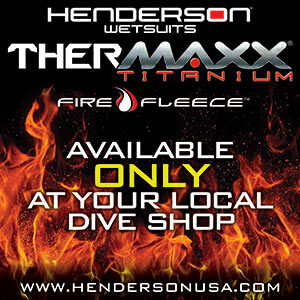 The owner of the dive center, a friend of Terry's, was away on the mainland. Terry advised the dive instructor to bring the distressed diver to him right away. Terry had no backup at the time; his men, several of whom are dive medical assistants (DMAs), were on the water conducting tactical dive training exercises. Recognizing the potential seriousness of the task ahead of him, Terry retrieved the oxygen unit, which included four jumbo-D cylinders, and the first aid kit. Next he called the owner of the dive center to explain that one of his guests might be suffering from decompression illness (DCI) and that he should arrange for an ambulance. A few minutes later the dive boat arrived at Terry's camp. The injured diver was sitting upright in the boat, in pain and screaming that he was going to die. He also reported difficulty breathing, and he was dressed only in beach shorts. Terry placed a blanket over him as the other divers carried him ashore and then, once he was laid down, placed an oronasal oxygen mask on him and commenced a neurological assessment. The diver was having difficulty breathing with the oxygen mask and tried to remove it. Terry immediately swapped it out for a nonrebreather mask and set the constant-flow rate to 20 liters per minute. He noted the cylinder pressure, the mask seal, the rise and fall of the diver's chest, the inflation and deflation of the reservoir bag and the fogging and clearing of the mask as the diver breathed. The diver did not respond to any of the questions or instructions Terry attempted to use to evaluate his mental status, coordination and reflexes. After about 20 minutes on oxygen, there were slight signs of improvement. With compassion and a calm demeanor, Terry spoke to the diver clearly and loud enough to be heard. The diver showed signs of extreme fatigue, impaired thinking, loss of coordination, numbness, hearing abnormalities and vertigo — possible signs of an arterial gas embolism (AGE). Terry had to use his commander's voice to shake the dive instructor out of his numbed state, and he directed him to look for a speedboat that could be used to take the diver to the mainland, 30 minutes away. A small gathering of tourists and local fishermen formed around the aid station. Ten minutes later Terry's men returned from their offshore training and began to assist. Although the diver's breathing was returning to normal, a red rash had begun to appear on his upper body. The diver was being cared for appropriately, and he was breathing from his second oxygen cylinder. He vomited, and it smelled strongly of liquor. The owner of the dive center came through with the ambulance, which was now awaiting the injured diver at the jetty on the mainland. Terry dispatched one of his high-speed military boats and three DMAs to evacuate the diver. It took them less than 20 minutes to reach the jetty, where the civil defense rescue team took over the diver's care. Two of the injured diver's friends were there to witness the horrifying moments, and one of them accompanied his suffering buddy to the mainland. Terry kept in touch with the owner of the dive center for the diver's prognosis. After an initial evaluation at the local hospital the injured diver was transferred to the nearest hyperbaric chamber in Kota Bharu, two hours away. The next day Terry found out the diver was being taken to a military hospital in Kuala Lumpur, where the facilities are more advanced. Terry Raphael (far right, in blue coveralls and hat) supervises combat divers in training for subsurface VBSS (visit, board, seize and search) and MIO (maritime interdiction operation) missions. After a review of the incident, it seemed the dive instructor had overlooked some signs that might have indicated the diver was hungover, intoxicated, exhausted or otherwise unfit to dive that day. Terry thinks it is likely that alcohol contributed to the accident. The review also revealed that supervision of the diver underwater may not have been adequate. The diver was participating in an introductory scuba experience that involved a shallow shore dive the previous day followed by the boat dive that morning. During the morning dive the instructor became aware that the novice diver was no longer in the group. It turned out he had panicked, done an uncontrolled ascent to the surface and swallowed seawater. He didn't keep his regulator in his mouth on the surface, failed to inflate his BCD and surfaced away from the boat. The chest pain and difficulty breathing occurred right after he broke the surface to make for what was undoubtedly a terrifying experience. It is important to consider that small dive resorts in remote areas do not always have the knowledge or physical resources to deal with incidents such as this one. It was fortunate that Terry and his group happened to be on the island doing their training. Two weeks after the incident, Terry received word that the diver had recovered and was mending well. Terry attributed his decisive and potentially lifesaving actions to his expertise as a diving supervisor in the Malaysian Special Operations Forces, but also to his training as a DAN Instructor. I am humbled and grateful for what Terry was able to do on that pivotal day.